As a geography buff, it’s a country that I’ve always fancied for its location — where the Indian Ocean and the Atlantic Ocean meet. South Africa found a more definitive place in my memory when I learnt about the country’s tumultuous history and extraordinary vineyards. Durban, ‘the warmest place to be’, is amid dark grey clouds and spells of rain when we land, but the drive to our hotel on Durban’s Golden Mile gives us a good glimpse of the city. A new day brings with it more rain and an informative drive to the Valley of a Thousand Hills. With one last uphill curve, our bus comes to a standstill and on alighting we are greeted by a number of locals dressed in traditional attire. With numerous ranges visible even on a fairly foggy day, it is only on seeing the panorama that I understand why it gets its name. 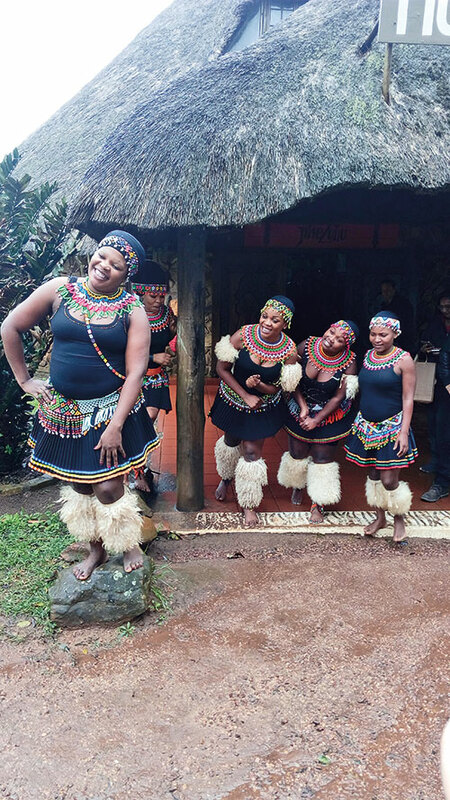 After a Zulu dance performance enacting the courtship and marriage customs of the people and a walk through the Cultural Village and Phezulu’s Reptile Park, we make our way back to the city centre. As accurately predicted by the locals, the following day the gloomy weather gives way to sunshine. Taking a stroll down the promenade lined with little shops selling local handicrafts, attire and colourful beaded trinkets, we see the city come to life, with previously idle waves hosting dozens of surfers and swimmers. Our walk along the waterfront is brought to a pause when we jump onto the Durban Ricksha Bus tour. Parking ourselves on the upper-level open area of the double-decker vehicle, we wait in anticipation. Soon, the loudspeaker comes to life and our guide for the day takes over, sharing anecdotes and local tales about the many places we drive past. From the beachfront and Victoria Street Market, to the City Hall, Durban International Convention Centre (Durban ICC), Emmanuel Cathedral and through Florida Road — every sight begs to be photographed and experienced. While the jump, off the Big Rush Big Swing at the Moses Mabhida Stadium, is something I have to regrettably miss, I make a mental note to come back for the picnic spots at Mitchell Park and to walk through the thematic environment of uShaka Marine World. 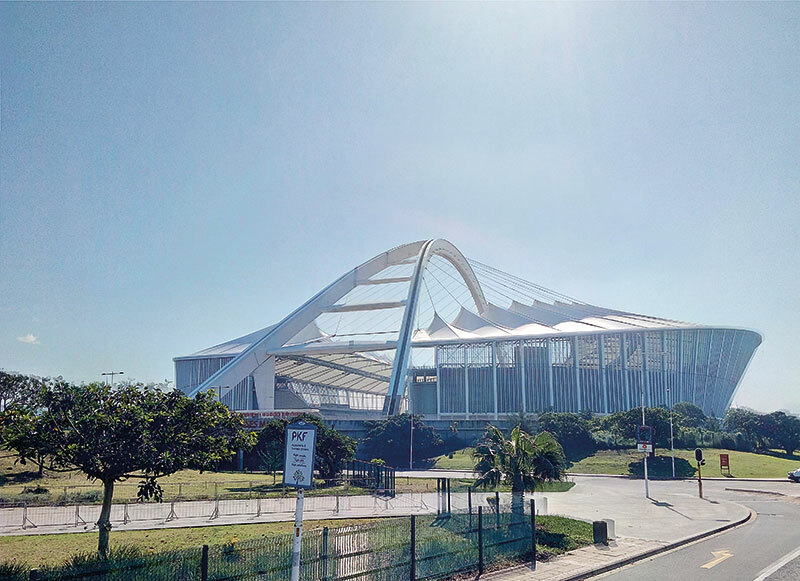 On the following day, we witness the grand opening ceremony of Indaba, Africa’s largest travel trade show, and walk through the Durban ICC and Durban Exhibition Centre. Some quick chats with locals and presenters at the tourism event help us discover South Africa and its neighbours more effectively than any amount of googling ever could have! Our last day in Durban brings with it our chance to see the sunrise, as we drive to the airport for our flight to Cape Town. 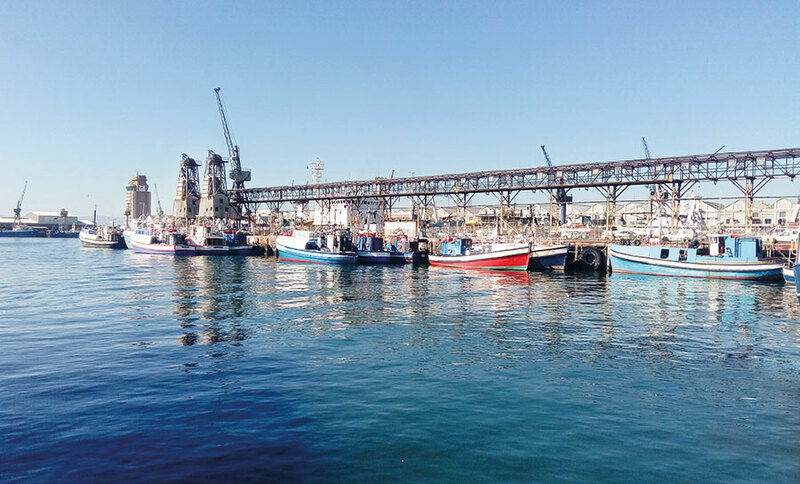 From sipping on a chocolate-mousse-infused shake while walking down the ever-bustling Florida Road, to dining with the sharks at uShaka Marine World’s Cargo Hold Restaurant, the coastal city has played host perfectly. 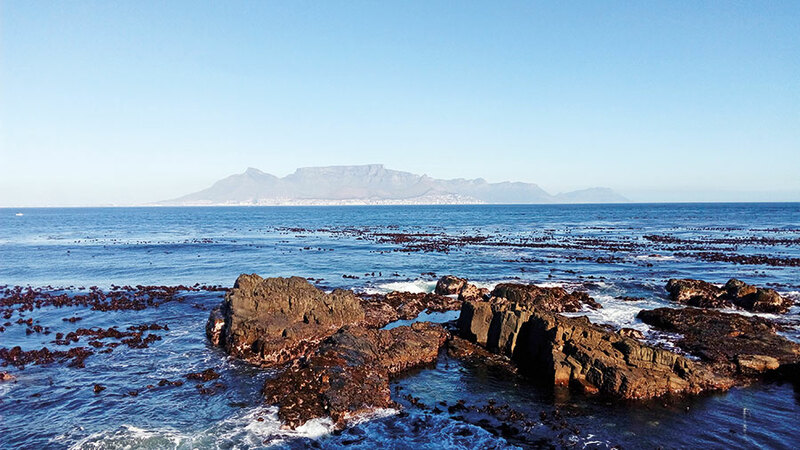 Cape Town, the next stop on our trip, is as pretty as a postcard and just a few hours away from the southernmost tip of Africa, Cape Agulhas, where the massive oceans meet. A melting pot of cultures, it’s both flamboyant and cosmopolitan in appearance and encloses within its confines attractions numbering a score and more. Our thirst to see the city is partially quenched over a drive to the V&A Waterfront which stands in the heart of Cape Town’s harbour. A quick lunch later, we board a ferry that takes us from the Nelson Mandela Gateway to Robben Island. Taking a bus tour around the site feels like a story — only heard of till that day — coming to life before me. On leaving the bus, we are introduced to a former prisoner, who is our guide for the very intriguing tour of the prison. His narration of the times he spent captive within those walls is riveting and at times nerve-racking. The limestone quarry, the church, graveyard, the army and navy bunkers and the maximum security prison are proof of all that occurred on the island over its 500-year-old history. The shimmering crystal-blue water of the Atlantic serves as great motivation for us to take the upper deck of the ferry on the way back. We do not take into account the biting cold and strong breeze that envelopes us through the ride, under the gaze of the azure sky and setting sun. I soon find myself hugging my jacket closer; my now-numb fingers clinging to my phone in one hand — with which I photograph everything that surrounds me — and clenching the railing with the other. Later that day, before a delicious meal, we try our hands at the djembe drum as singers and dancers shake a leg around our tables. After 45 minutes, every morsel from the unique and traditional 14-course set menu feels blissful. We make our way from the hot and zesty Zanzibar soup through the crunchy samoosas, kandolo balls and Moroccan grilled vegetable couscous, to the delicious orange and walnut dessert that marks the end of our meal. On the day of the Table Mountain visit, all armed with sunscreen and comfortable shoes, we take our bus to the lower cable station. Here we get onto the aerial cableway, the rotating floor of which gives us a 360-degree view. Stepping out and looking at the unspoilt flora, which seems to change course with every gust of wind, I’m reminded of the trivia our guide had shared — there are more species of plants within the Table Mountain National Park than there are in the whole of the United Kingdom! A warm cup of joe and some souvenirs from the Shop at the Top later, we walk along and sometimes off the path, itching to explore further. That afternoon, all zipped up in biker jackets, we get going on our chauffeured vintage sidecars. The thrill of riding down the winding roads to the beach, the wind in your hair, is one I’d only seen happen in the movies. 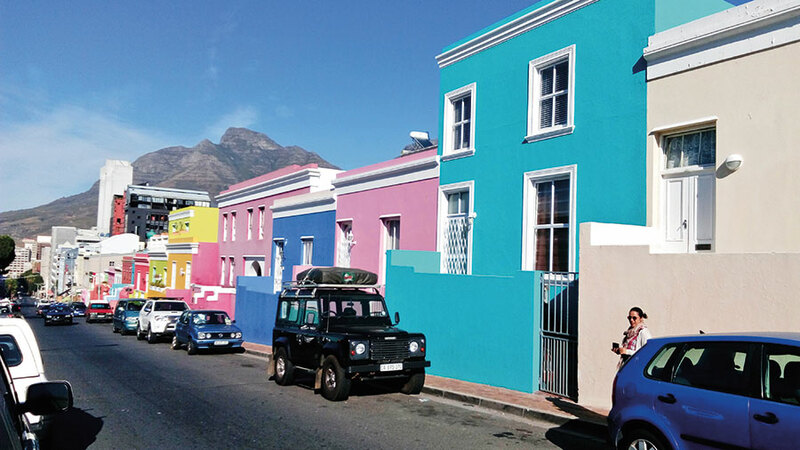 We make one last stop at Bo-Kaap. Formerly part of the Malay Quarter, this bright and vibrant neighbourhood’s USP lies in the colourful houses that line the streets here. A delicious meal and dozens of photos mark the beginning of our drive to the town of Hermanus. Reminiscent of what I think can only be a reality in fairy tales, the drive to and what we see of Hermanus is a really stunning spectacle! Holding its own with a contemporary yet old-world charm, the seaside town is known to most as the official whale watching capital of the world. We make a quick stop to check in at the Arabella Hotel and Spa before heading out to Misty Waves Boutique Hotel for dinner. The vegetarian in me gorges on the lentil delicacies and fresh guacamole with warm bread, as I see my fellow travellers devouring the crispy prawns — a particularly well-mannered friend demolishing them with her bare hands! The next morning brings with it the prospect of swimming with great white sharks in a few hours. From the quick ride to the middle of the ocean to getting into your wetsuit and being lowered into the cage, it is an adrenaline rush that stays with you long after you’re brought back to land. Dipping your head into the water and being that close to the predators isn’t something everyone can stomach! Quad biking, another one of our activities for the day, is one that I make the most of. An incredible escapade, we drive through vineyards, the native fynbos plants and up to our halfway point, from where we overlook the town and an unending ocean. At the end of this quad bike trail with South African Forest Adventures, I am beaming. Our last day in the country brings with it a quick stop at Betty’s Bay to see African Penguins that steal our hearts with their waddling. From there we head to the Neethlingshof Estate, in Stellenbosch, for a wine tasting session, before driving through the breathtaking Clarence Drive Scenic Route — probably the most gorgeous stretch I’ve ever witnessed! A trip that comes to its end too soon, having a few hours left makes me think about my time spent in South Africa. What stands out is that every day, I’d walk outside to simply stare at the expanses in front of me. Because such are the landscapes of this country, they demand a second, third and even fourth look. Holding onto that thought and the memories I’ve stacked up, I watch the orange sun set into the looming hills, and minutes away from boarding, stand by the gate and bid the ‘rainbow nation’ my final goodbye. Early on a Thursday morning, some of us manage to keep our date with the Hluhluwe Game Reserve at the Hluhluwe-Imfolozi Park (north of Durban) where the great African safari awaits us. 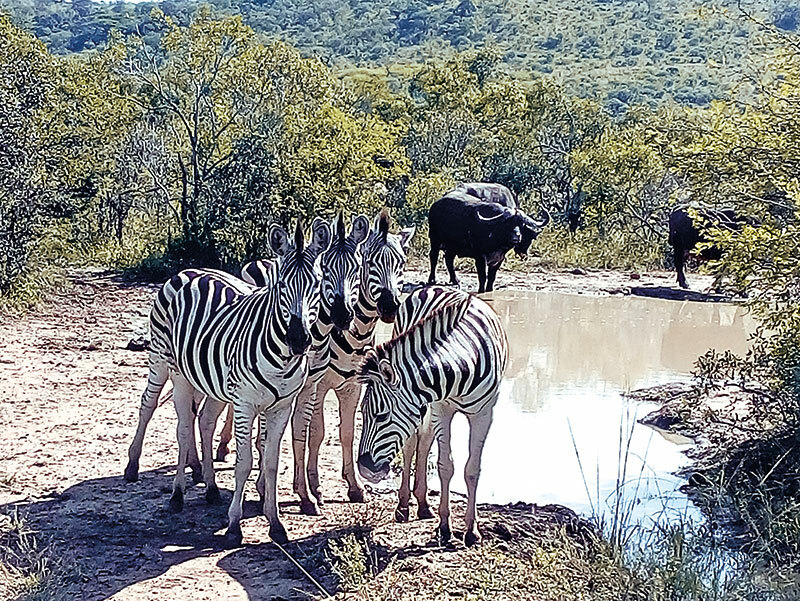 Hoping to be able to spot all the big five and more, we set off in our Open Game Drive Vehicle (OGDV) — the animal sightings dependent mostly on our luck and the razor-sharp vision of our ranger. First off, we catch sight of a giraffe, lean and majestic. Just recovering from having seen the towering beauty, in a twinkling I find myself gawking at zebras, about half a dozen of them posing for us forest shutterbugs. Advised to steer clear of the endangered white rhinos, we think it wise to appreciate them from afar. What’s not to love about an elevated window seat in the OGDV and a ranger who can spot a herd of elephants so far away that we actually have to zoom in on an HD image to see them! We come across impalas tucked away in various corners, nyalas and lots more fauna. As we leave the confines of the game reserve, to close our safari experience, we have an eventful episode with a buffalo. The mammoth animal comes to a standstill before our minivan, and stands there for a few minutes while we wait patiently after being told that it is probably the most dangerous animal around — with the lions, leopards and cheetahs being tough competition. Our tryst with the reserve is nothing if not extraordinary!